You are here: Virgin Islands News Online » News » New VI Opposition Leader coming? New VI Opposition Leader coming? ROAD TOWN, Tortola, VI - In the Virgin Islands (VI) political sphere, pundits within the breakaway group, Progressive Virgin Islands Movement (PVIM), are allegedly discussing the need for a potential change in Opposition Leader. To date, there have been no formal discussions with or letter written to Governor Augustus J. U. Jaspert on the matter. Under the Constitution Section 70, speaks to how an Opposition Leader is appointed. A majority of Opposition Members must tell the Governor who they wish to lead them in Opposition. 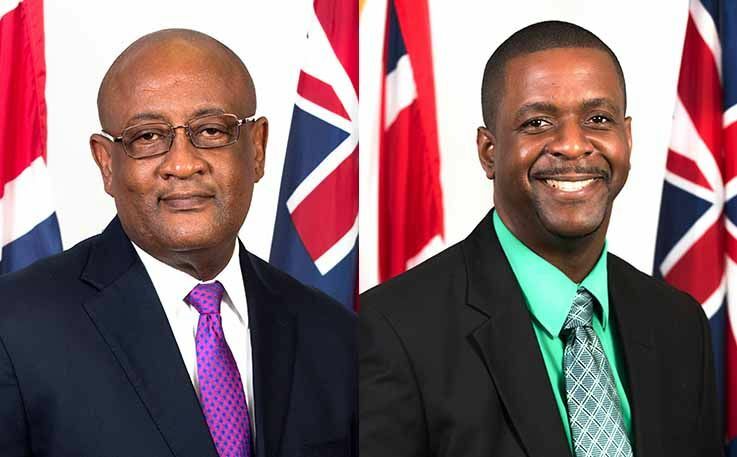 Many close to the matter told Virgin Islands News Online (VINO), it is expected that the Opposition Leader post will change before the House of Assembly (HoA) is dissolved, giving way for a new general election. Currently, Hon Andrew A. Fahie (R1) is the Leader of the Opposition. He was appointed after he won the Virgin Islands Party (VIP) Chairmanship a year ago, when the former Governor stripped Hon Julian Fraser RA (R3) of the title after he lost the VIP Chairmanship. At that time there were only 2 members in Opposition. He command the majority according to section 70 and should have been the leader long time ago actually. Just like you Ronnie! It is all about power eh. We will consider you for Leader of Opposition after General Election if you are lucky to win a seat. Who wants power for two weeks? If it won’t make a difference then why are you bothered? Can you read to understand? The article says that he is NOT pushing to be the Leader of the Opposition at this time. and those 40 idiots who liked your comment obviously did not read to understand either. all them NDP2 people power hungry. This party was not formed during the last elections and when the sitting of the House of Assembly started so how can he become the leader of the opposition. This BVI got so much hurting and suffering people and all the political people can do is fight for power. All ah them just sickening. It doesn’t matter. It exists now and he has all the votes lol. Andrew did it to Fraser so what’s the issue now. All VIP on here chatting crap. And the backstabbing begins. Hungry for POWER. The old people say - when someone show you who they are for the first time believe them. Andrew will find out who is now in his camp. I guess now I know how Fraser felt. Fraser should have still been LOO. He wanted the power too. Any problem the Governor has I’m the elections he will consult the Premier and LOO so Ronnie should have that place. The people will see the true colors of Ronnie. He is about POWER! Politics is all about power. They all run for the power. Andrew did this just a year ago. You forgot? Hon. Fahie is an awesome Leader of the Opposition. Without him the public would not have known the half of the many wrong doings by the NDP with our hard earn tax dollars. That was his role. The role will be someone ekse’s Ronnie will do that do. You are their focus. They are trying to protect you. What Ronnie going to oppose as Leader of the Opposition when he was part of all the decisions over the past 8 years with the NDP. let freedom reign: democracy at work: Fahie could have left fraser as opposition leader but did otherwise: at the end of the day it is the voters that holds the power but we do not exercise such power: after we done vote and the administration is set in a place(we the voter just sit back and allow all manner of bull-$h!t to go one)...simply based on the current conduct of those seeking to lead our people into the future you should already come up with a rational desigion: I simply feel all of the current set should be sent off to round rock and live happily as one disfunctional group: look for a fresh group of good men and women then vote them into political leadership(keeping a close eye on their conduct) no more back to back terms in political office; after 4 years exit office and a proper audit conducted on the behalf of the voters/tax payers: can you imagine you working in a private firm and you can not give an account for 7.2million of that company’s funds: you will end up Road Town police; then john’s hole and finally up the jail house!!!!! Speak for yourself. Fraser should have given up the leader of Opposition when he lost the Head of VIP. Fahie paid his dues for years in politics. He gas proven to be a great leader. He has handled the post of Leader of Opposition admirably and he is still young. All then skeltons is about power want ro control everything ....and their behaviour is so bad .like they should have everything when rhey want and how they want ...not because your last name say Skelton...respect others ...I sick of them attitude..
Fahie already did his job as leader of the opposition. If Ronnie wants the job for two weeks he can have it. The HOA will desolve just now. So why you worried then. You will see why the majority leader should be just that soon enough. Ronnie too soft on his former colleagues to be opposition leader. Plus he voted favorably for all previous projects under NDP. He would prefer to leave those cats in the bag before they end up coming back to haunt him. This doesn't sound like Ronnie . This more sound Like the other 2 and the man from the 3rd pushing this Narrative to create division and confusion . Ronnie Needs to kill this talk. A true leader is not always about numbers . Take a stand Ronnie against this Antsness idea. Be the leader you are ...Avoid another negative conflict ..